Our B&B did a very good &B, giving us full bellies as we prepared for a day of hiking. 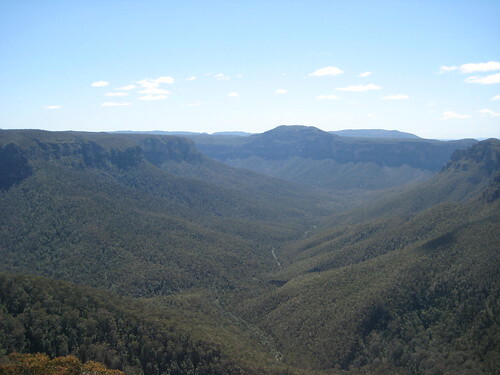 We began the long walk along Govett’s Leap Road to the lookoff, and were rewarded with some spectacular views. 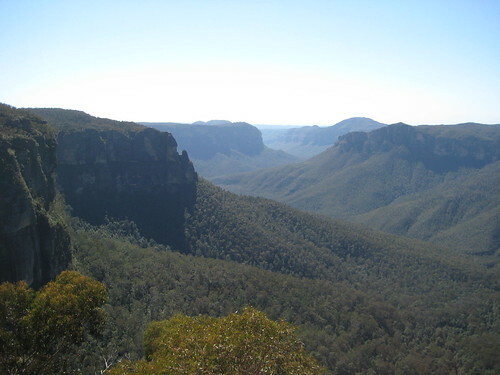 The Blue Mountains aren’t really mountains; they’re a plateau with valleys that were carved out over millennia. We decided to follow the trail along (roughly) the edge of the valley, heading up and down hills to occasionally emerge at a number of superb lookoffs, eventually reaching Evan’s Lookout. Interesting note: nearly everyone we encountered on the trail was French. Not sure why that was, but my brother said it was much the same when he visited the Blue Mountains. Even one of the two couples at our B&B was French. Weird. Anyway…having completed a supposedly 90-minute hike in 60 minutes, we were feeling confident that we could do the moderately difficult “grand canyon” hike. The only elements which gave us pause were Nellie’s knees — the perils of short legs — and the probably-insufficient water we carried with us. Still, we thought we’d give it a shot, and descended into the canyon. We knew it would be one of the few opportunities we’d ever have to descend from the top of the canyon wall down to the floor and back out again. We were hot at first — it was the first hot, sunny day we’d had in/around Sydney since arriving — but cooled down as we got to the valley floor. 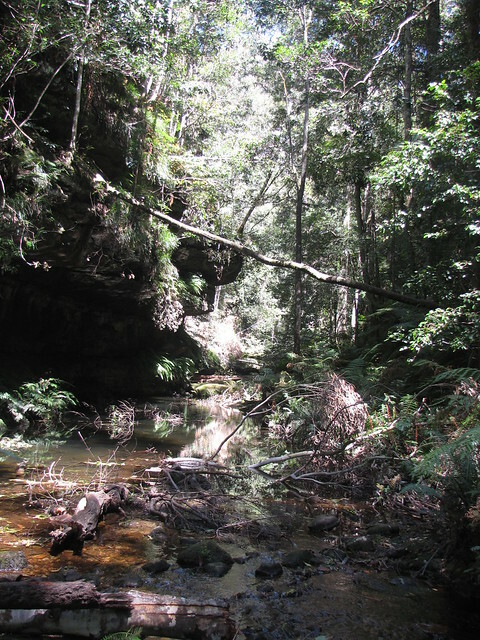 We began criss-crossing the stream, climbing over slippery rocks and fallen trees. We walked through a tunnel in the rock, ate lunch in front of a waterfall and then hiked behind it, looked up and saw innumerable streams of water dripping over the canyon walls and onto our faces. Finally, after nearly two hours, we began the long ascent out of the canyon. Something strange happened on the way up, something we were barely witnesses to and so have trouble describing. As we walked we heard a number of birds sing strange songs. Urgent songs, we realized later, because suddenly — just above our heads — we heard an incredible rustling. We looked up and saw a small tree being shaken violently. I saw a reptilian head extending from a rock outcropping and into a huge bird’s nest; Nellie saw a tail. It took us a few seconds to register than we were watching a very large lizard eat a bird, or perhaps a bird’s egg. I did see more tail feathers peek out from a neighbouring nest, in what seemed like a defensive position, but no further action occurred. Of course, it happened so quickly that neither of us got a camera out and up, but a little googling later on led us to believe that we’d seen a goanna attack the nest. Excitin’! We spent the next half hour or so ascending, getting warmer, and getting thirstier. 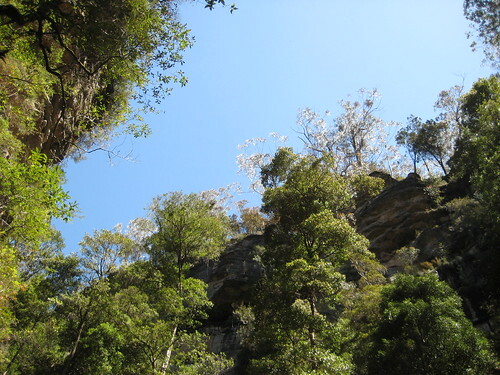 We emerged in a cark park well south of Blackheath, thinking it would be a short walk back. We drained our water and started hiking. After half an hour we were still nowhere near our B&B and were considering hitchiking. Suddenly an SUV pulled up and asked if we needed a lift. A very, very, very nice Scottish lady named Mary gave us a ride into Blackheath, telling us we weren’t the first poor souls she’d rescued after hiking the canyon. At least we didn’t knock on her door asking for water or to us the toilet, as many others had! So, three cheers for Scottish Mary. We raised a glass to her that night. Our dinner was pizza and pasta made at a place around the corner, along with the truly excellent Cabernet Sauvignon we’d gotten from Knee Deep the previous weekend. Then home we did go, to rest our weary bones.